Rajasthan BHMCT Counselling 2018 – Centre for E-Governance (CEG) has issued a notification of admission in BHMCT programme for academic session 2018-19. Admission in the BHMCT programme will be done through Centralized Online Counselling. 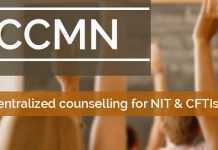 Candidates can check complete information of Rajasthan BHMCT Counselling 2018 like registration, venue, procedure, counselling dates etc. on this page given below. Latest: Tentative Merit Of BHMCT-2018 Candidates has bee released. Scroll down to check the same. Centre for E-Governance (CEG) has issued a notification of admission for the session 2018-19 in all Govt./Private Institutions/Colleges/University running BHMCT programmes will be done through Centralized Online Counselling. It is mandatory for colleges/institutes to register online to participate in Counselling process. Schedule for Rajasthan BHMCT Counselling 2018 is given below. 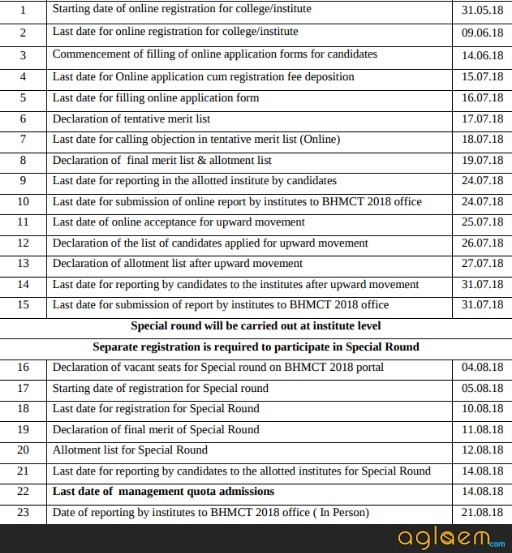 Centre for E-Governance (CEG) has released Tentative Merit Of BHMCT-2018 Candidates. Candidates check the tentative merit from the official website and also check it through the direct link which is provided below for the sake of candidates. Merit List: Click here to check Tentative Merit Of BHMCT-2018 Candidates. An Indian citizen having senior secondary in any subject from recognised board with at least 45 % marks in aggregate (40 % in case of reserve category of Rajasthan state) without any approximation in the senior secondary examination. Eligible Candidates who have passed in Senior Secondary and having Rajasthan State Domicile. Eligible Candidates who have passed in Senior Secondary and belongs to outside Rajasthan state. Rajasthan State Centralized Counselling has issued a notification for Bachelor of Hotel Management & Catering Technology 2018. Candidates of BHMCT programme are required to fill the registration form on the official website www.bhmct-raj.com or through the direct link given below. Fees – Candidates have to submit a demand draft of Rs 1200/- in favor of “Coordinator BHMCT-2018 Centre For E-Governance“ payable at Jaipur. Candidates have to upload a scanned copy of demand draft at the place provided for it in the application form. There is no other way or agency for the submission of this fee. Only online application will be accepted. The candidate has to follow the given process for filling online application form. The BHMCT-2018 application form is to be submitted online by following the instructions provided in this information booklet and web portal of BHMCT 2018. The candidate must fill, carefully, all details as required in the online application form. Candidate fills up his/her application form at his/her own level through website www.bhmct-raj.com.Candidates have to submit a demand draft of Rs. 1200/- in favor of “Center For Electronic Governance Society – Convenor BHMCT – 2018 “ payable at Jaipur. Candidates have to upload a scanned copy of demand draft at the place provided for it in the application form. There is no other way or agency for the submission of this fee. The application fee deposited for BHMCT 2018 is neither refundable nor transferable/adjustable for future BHMCT or any other counseling. Last date of submission of the online application form will be strictly as notified and as per schedule given on web portal. Candidates are advised to visit web portal frequently. Candidate is required to upload their recent passport size photograph and signature on online application form at the web portal. Ensure that the image size of photograph should not exceed 100 KB (Maximum) in the JPG/GIF/BMP Format, the image size of signature should also not exceed 50 KB (maximum) in the JPG/GIF/BMP Format and the image size of demand draft should not exceed 100 KB (Maximum) in the JPG/GIF/BMP Format. The candidate has to fill their details as required in the online application form. Candidate may edit the details entered by them before they click the “SUBMIT” button for final submission. Once the candidate clicks the “SUBMIT” button, they will not be able to edit the entered data. Therefore, the candidate is advised to click “SUBMIT” button only and only if they are sure that the data entered in the online application form is correct, complete in all respect and no further editing is required. The BHMCT-2018 will not be responsible for any consequence arising out of non-acceptance of any correction/addition/deletion of any data of the application form after clicking the “SUBMIT” button. Subsequent to final submission of online application form, a printout of application form with a unique form number will generated by web portal. The candidate is required to take printout of application form. It is advised that the candidate must retain a copy of this form for future references. Visit our website i.e. www.bhmct-raj.com and fill up your application form by entering all necessary information. Please make sure that marks obtained in XIIth (in %) is filled and scanned copy of signature, photo and demand draft have been uploaded. If marks have not filled, you will not be considered in merit list. For College Choice candidates have to login again afterwards when link of college choice is made available. Candidates are advised to visit web portal frequently. If college option has not filled by candidate when it is available on web portal then it will not be considered for college allotment. Check all entries you have filled in. If all required entries have been filled then click on “Submit” button for submitting application form and take a printout of application form for future references. Eligible candidates who have passed in Sr. Secondary and having Rajasthan state domicile. Eligible candidates who have passed in Sr. Secondary and belongs to outside Rajasthan state.